The following chapter has been contributed by the author Brian Rowan, with the permission of The Blackstaff Press Limited. The views expressed in this chapter do not necessarily reflect the views of the members of the CAIN Project. The CAIN Project would welcome other material which meets our guidelines for contributions. This chapter is copyright Brian Rowan 1995 and is included on the CAIN site by permission of the author and the publishers. You may not edit, adapt, or redistribute changed versions of this for other than your personal use without the express written permission of the author or the publisher, The Blackstaff Press Limited. Redistribution for commercial purposes is not permitted. The year 1994 was one of enormous significance for Northern Ireland. After twenty-five years of destruction and bloodshed, both the Irish Republican Army and the Combined Loyalist Military Command announced ceasefires. Their reasoning was far from identical: republicans believed that political forces in Ireland and abroad were moving inexorably towards a united Ireland, while the loyalist cessation was delivered on the assumption that the union with Britain was safe. 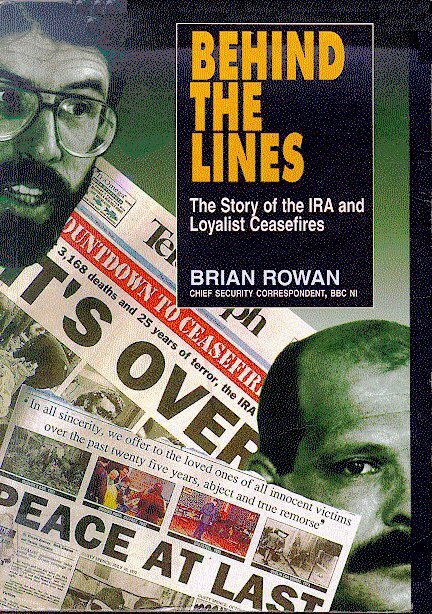 Only time will tell which analysis was correct, but in this revealing new book Brian Rowan, Chief Security Correspondent of BBC Northern Ireland, exainines in detail the key events that led to both ceasefires, describing the policy changes within Sinn Fein as well as the emergence of a new pragmatism within the loyalist groupings. Capturing the increasingly dramatic pace of the headline stories as they broke, he also presents the hindsight analysis of many of the main players, as conveyed to him in exclusive interviews in late 1994 and early 1995. Among the people prepared to speak to Rowan 'on the record' were Gerry Adams, Gary McMichael, Martin McGuinness, David Ervine, John Hume, Albert Reynolds, Hugh Annesley, Cardinal Daly, Archbishop Lames, the Revd Roy Magee and Senator Gordon Wilson. A compelling look 'behind the lines' at the often shadowy world of Northern Ireland politics, this book provides vital insights into the shifting strategies of all sides in the most hopeful period yet in the North's troubled history. The months of 1994 would be the most important in the history of modem republicanism - a time when the movement's key strategists would have to make fine judgements and balance the worth of armed struggle against the potential for political progress. Gerry Adams argues that the ceasefire declaration of 31 August 1994 took 'remarkable courage' given that from the IRA's point of view it placed its whole 'struggle' on the edge. The decision was unquestionably a remarkable one in that it represented a unilateral cessation - an illogical step in itself given all that had been said in the past by republican leaders and the political equivalent, if you like, of the cow actually jumping over the moon. Republicans, however, see the ceasefire as an initiative linked to political developments which may or may not bring a final resolution to this conflict. The strategy, they admit, is a high-risk one and no one knows how things will work out. The IRA statement on 31 August 1994 emerged from a process of slow, detailed consultation not just within the ranks of republicanism but involving others. Indeed, Gerry Adams says it has to be seen in the context of three statements from Irish-America, from himself and John Hume and from the taoiseach Albert Reynolds in the immediate period before the ceasefire announcement. In the latter part of 1993 and in the months of 1994 there was a very clear tactical adjustment within the IRA's campaign. Its violence in that period was directed almost exclusively against the security forces, and incendiary devices replaced car bombs in attacks on 'economic targets'. In October 1993 the Shankill bombing had seriously damaged the 'peace process', and in this reworking of violent methods the risk of a similar 'blunder' occurring was being greatly reduced. When I discussed with Gerry Adams the period leading to the ceasefire, he spoke to me of knowing what makes the IRA 'tick', of knowing where it comes from, and in terms of its deliberations over the ceasefire he told me he would have understood whatever decision the IRA would have taken. That it came to the conclusions that it did had much to do with the type of arguments being put forward by Adams and by Martin McGuinness - two men whose influence over a period of two and a half decades had remodelled republicanism and reshaped its thinking. Republicans do not yet believe that the causes of the conflict as they see them have been removed, but they are on the agenda and republicans believe that a favourable political climate exists at present in which there is the potential and the possibility for progress. Whether enough progress can be made to satisfy them, however, and to ensure there is no return to the violent methods of the past, is another matter. A look at how the IRA acted in the period after the Shankill bombing shows that tactical switch in its campaign. In the closing weeks of 1993 there were five more IRA killings and all five victims were members of the security forces. Three of them were killed in single-shot sniper attacks. As the year turned, there was still no indication of definite moves towards peace and at the start of 1994 several businesses in the greater Belfast area were destroyed in firebomb attacks - incidents which left behind a repair bill running into millions of pounds. The first IRA murder of the year happened on 17 February when a young RUC officer, Johnston Beacom, was killed in a rocket attack in the Markets area of Belfast. In the early part of the following month, an off-duty police officer was shot dead at a greyhound stadium in the north of the city. Around this time there were also attacks on Heathrow, where on three occasions in the space of five days between 9 and 13 March mortar bombs were launched at the airport. The devices did not explode but the IRA was demonstrating what it was capable of. If' peace was coming there was not much evidence of it on the surface. But in a statement at this time the IRA said it remained 'positive and flexible' and there was a need for the British government 'to move from its current negative stance': the continued opportunity for peace should not be squandered. At this time, Sinn Féin was still demanding clarification of the Downing Street Declaration from the British government and in late March I again interviewed Martin McGuinness to explore with him the republican analysis of the situation. On the issue of clarification he said he felt this could be cleared up in a couple of days and then a judgement could be made as to whether or not there were grounds for moving forward, but he stressed that republicans were not interested in the type of secret contact with Britain that had been the subject of so much controversy those few months earlier. Sinn Féin wanted its contact to be 'up front' and 'out in the open'. I asked him at what level he would expect this contact to take place, and he said at a level of the British government sending along people who could represent their point of view. Republicans would not set preconditions as to who these people should be: 'We're not, for example, looking for a meeting with the prime minister. What we're looking for is for the British government to recognise that we have a mandate, a democratic mandate, to represent people who have been oppressed and unjustly treated by different British and unionist regimes over the years. We're going to fight like lions to defend the right of those people to have their opinions listened to.' As we stood in Cable Street in the Bogside area of Derry chatting after the interview Martin McGuinness explained to me that his reference to fighting like lions was meant in the political sense. Given the twin strategy of republicanism he obviously felt the need to give some 'clarification' of his own. At the time of the publication of the Downing Street Declaration the British prime minister had made clear that republicans could enter the democratic political process within three months of an end to the violence, and in that interview with Martin McGuinness I asked him for his views on this. Making peace is a difficult business for all involved but the difficulties must be overcome. That too is the responsibility of all involved but particularly the British government. We hope that the further opportunity here provided is used to that purpose and effect. This development was welcomed by Gerry Adams, who called on John Major to authorise direct and immediate talks between British government representatives and Sinn Féin. At around the time of the IRA announcement the prime minister had arrived in Northern Ireland for a short visit and his reaction to the cessation was to describe it as a cynical public relations exercise. In Dublin, Albert Reynolds said he was disappointed that the ceasefire was for such a short period, but he did add that he was glad that it was unconditional and unilateral. Yet another view was given by the RUC Chief Constable, Sir Hugh Annesley, who described the shortness of the Easter ceasefire to me as derisory, but then added, 'I don't think it was deliberately intended at that stage just to be a three-day ceasefire by the leadership of PIRA. I suspect at that time it was all they felt they could get, but I think the condemnation both inside and outside Northern Ireland from all shades of opinion was quite staggering. I mean even the radio broadcast that morning asking people in the street what they felt must have carried a message back to the leadership of the republican movement." Despite the criticism of the Easter cessation those within republicanism saw it as significant. Given the different levels of political sophistication within that movement, small steps would have to come first. Easter 1994 meant that temporary ceasefires were once more an acceptable tactical option within the republican movement; the IRA, it seemed, had finally exorcised the ghosts of ceasefires past. During the ceasefires of the 1970s, republicans at the most senior level believed that Britain acted in bad faith. They also feared that ceasefires could damage the IRA beyond repair. That is not to say that the delivery of this brief break in violence had been straightforward. Indeed, security sources told me that it brought 'massive complaint at grassroots level' within the IRA about a lack of consultation; this assessment says that internally it was a 'disaster' for the republican leadership in terms of how they had handled it. Again according to this assessment, the process from Easter right through to 31 August involved 'massive planning, massive consultation - a massive show of democracy on their part [the republican leadership's] to keep their people behind them'. The challenge for the leaders of republicanism during this period was to bring the 'critical mass' of their organisation along with them and to avoid a split at all costs. The role of Gerry Adams in this whole evolving process was 'pivotal' and as he and others such as Martin McGuinness moved to persuade the broad republican movement of the political worth of an unarmed strategy they had majority backing from the IRA Army Council. Security sources admit that it is inconceivable that the ceasefire could have been delivered without Adams; according to this assessment he and McGuinness were 'the lead players' in the debate. For republicans there was a choice to be made. Was it to be a continuation of the IRA's 'long war' or would they travel the political path? Outside the ranks of republicanism the man best placed to read the mind of Gerry Adams was perhaps John Hume. He was convinced that if anyone could deliver an IRA cessation it was the Sinn Féin president, but he also knew that it would take time: 'That's why after Downing Street I was the one person who kept telling people to be patient because I realised that given the nature of their organisation that it had to be intensive dialogue involving every single member.' Any mishandling of the situation could have led to a split within republicanism and the consequences of that could have been lethal. Intelligence information on the internal debate within republicanism was reaching the security forces at 'three discernible levels' in the months running from the Downing Street Declaration through to August 1994. At a leadership level within the republican movement there were those who were arguing that 'armed struggle' had run its course and that more could be achieved by going the political route. The aims and objectives of republicans would not change, the organisation would remain intact, munitions would not be handed over in case there was a need to return to violence, but the argument being put was that more progress could be made through unarmed struggle. This assessment was given to me by a senior security source and continued as follows: 'At a level lower than that you had people in mid and high positions saying it [the ceasefire] won't work, it can't work but we will be prepared to give it a chance on the proviso that we keep intact, we keep gathering intelligence, we keep meeting regularly and we retain our position that we reserve the right to hit back and hit back hard; and, at grassroots level, you had people saying, this is crazy.' At this level within the organisation, the feeling was that war' was all Britain understood. According to security sources the difficulty throughout this lengthy period and the reason the ceasefire took so long in coming was this whole process of consultation and persuasion that indeed the 'war' should be over. These sources made it clear that republicans had not suddenly come to believe that violence was morally wrong but that the debate within the movement had been won on the argument that more could be gained along an unarmed path'. In this process of internal scrutiny, republicans had come to the view that more progress could be made if they could win the backing of significant 'political forces' for a peace process. Critical to all of this was Irish- American opinion and the positions taken up by the Dublin government and by John Hume. While the internal debate continued so too did IRA violence; this was still dominated by attacks on the security forces although there were also incidents which resulted in civilian deaths. On 24 April two Protestant men, alleged by the IRA to be members of the UFF, were shot dead in Garvagh, County Londonderry, but that claim by the IRA was dismissed by the loyalist group, which accused the IRA of trying to cover up and justify the random sectarian murder of Protestants. In the early hours of the following morning I would find myself covering the aftermath of what the IRA called an 'anti-drugs operation' - a series of shootings across Belfast in which one man was killed and sixteen others were wounded. The IRA called this a preliminary strike in an ongoing operation. The days of May would also bring more killings including the murder of Fred Anthony, who was a cleaner at an RUC station. His young daughter Emma was seriously injured in the incident and pictures of her fighting for her life in a hospital bed touched the hearts of the people of Northern Ireland. Fortunately she survived, but another family had been scarred for life. Two soldiers were also killed in May, one in an explosion; the other, a part-time member of the Royal Irish Regiment, was shot after being abducted. In June the IRA attempted to kill the prominent Portadown loyalist Billy Wright and weeks later shot dead Ray Smallwoods, a political adviser to the UDA leadership and one of loyalism's principal theorists. I learned in 1995, during my research for this book, that in the weeks leading up to this killing the CLMC had outlined its terms for a ceasefire in a document passed to two clergymen, the Presbyterian minister Roy Magee and the Church of Ireland Primate Dr Robin Eames (see Chapter 12). Meanwhile, British clarification of the Downing Street Declaration had been given to Sinn Féin in a series of written answers in May and, as the party moved towards its special conference in Letterkenny in July, where it discussed the document, speculation about a ceasefire continued. Republican sources, however, were steering me away from expectations of such a development at this stage and were stressing that the necessary pieces of the jigsaw were not yet in place. This was another issue I discussed with Gerry Adams when we met in March 1995. 'Some of the media got themselves into a quandary that we mismanaged the media element of the Letterkenny conference. That isn't the case. We had hoped that the Letterkenny conference would have taken place in a climate where the statements which came on the direct eve of the IRA statement [of 31 August], that we would have had Albert Reynolds, John Hume, Irish-America making the type of contribution that they later did, but that was not possible for all of them to do that at the time of the Letterkenny conference. So we went into the Letterkenny conference knowing that as we came out of it - because the media had spun this as one where there was going to be this great breakthrough - we knew that there couldn't have been a breakthrough because the ingredients, the parts of the jigsaw, were not in place. That's why Albert Reynolds, who was aware of this, was able to take a different attitude than everybody else because he knew that it couldn't happen, that the media had it wrong, that it couldn't happen at that time. He knew why it couldn't happen and he probably had a fairly educated guess that it would happen because the people who were required to make a contribution were favourably disposed to doing that. So we knew we were going to get it on the chin after the Letterkenny conference because there was this false perception about what it was about.' It will emerge later that Gerry Adams gave the IRA a detailed briefing on his analysis of the political situation in the period leading to the Letterkenny conference. The British have no right to determine how we exercise the right to self-determination. This is a matter for the Irish people. Time and time again in the declaration the [unionist] veto is reiterated. The Downing Street Declaration is also replete with reassurances to the unionists which are nowhere matched by any recognition of the rights of nationalists. The denial of nationalist rights is not addressed in the Downing Street Declaration. Nationalists are locked into the British state against their wishes. Their consent was never sought. The right to give or withhold consent was not and is not extended to nationalists. Republicans saw the declaration as part of a wider process and not as a solution. (This point was underscored in the IRA ceasefire statement when it eventually emerged at the end of August.) The declaration did, however, enjoy wide and significant international support. In his comments to me in 1995 on the Letterkenny period, Gerry Adams mentioned Albert Reynolds: the Sinn Féin president believes that the then taoiseach brought an important quality to the peace process - a quality that centred on his ability to take decisions. Adams spoke to me of Britain having to deal with a Dublin taoiseach 'who was fit to say to them, I'm doing this, I'm doing that'. Certainly Reynolds was sending signals to the republican movement that it was worth their while pursuing a democratic political path. His government lifted the broadcasting ban on Sinn Féin in the Republic in January 1994, and through a chain of intermediaries he had agreed in advance that in the event of a complete end to violence there would be movement on the issue of what republicans call 'political prisoners' and he would meet Gerry Adams publicly within a week of an announced cessation. After my meeting with Gordon Wilson in Dublin on 2 February 1995, I spoke with Albert Reynolds for over an hour in his office in Leinster House. By this time he was no longer taoiseach, his government having fallen in a row linked to the handling of an extradition case involving a priest, and he was now able to talk that bit more freely. The Reynolds government had a network of intermediaries giving them a link to both communities in the North. To ensure confidentiality the project was confined to the taoiseach's office; his aide, Dr Martin Mansergh, played a vital part in this process. The clear message being sent to republicans focused on the need for an end to violence before real political progress could be made, but Reynolds knew they would first have to be persuaded of the worth of an unarmed strategy. 'I was well aware throughout from the very start that an alternative strategy would have to be put in place that would make it possible for the leadership of Sinn Féin to go to the IRA Army Council to try to convince them that there was an alternative route, a route through the democratic process that could produce results and that there was a vast amount of goodwill and support to be gathered around the world behind this new direction.' It was this type of thinking which prompted the taoiseach to take up a strong position in favour of Gerry Adams getting a visa to enter the United States in February 1994, a move the British government was opposed to. Albert Reynolds was demonstrating his willingness to be decisive, his willingness to use the influence of his office to persuade the US administration that the 'risk' of granting a visa was worth taking and he was doing this in the knowledge that Britain was opposed to such a move. But the taoiseach was also using his intermediaries to hammer home to republicans the price Dublin was seeking for its involvement in this process: a complete cessation of violence. Albert Reynolds had researched Adams: he spoke to me of watching him and of reading everything he had said going back over a number of years: 'I felt that there was a change of direction taking place and that he was trying to lead the republican movement into a peace process but first of all he had to be convinced that there was a future in the peace process.' The taoiseach said he knew the Sinn Féin president had to be able to demonstrate the worth of an alternative strategy 'and it was demonstrated on a number of occasions that what he had come looking for he was able to deliver, such as the visa to Washington, such as Section 31 [the dropping of the Republic's broadcasting ban on Sinn Féin].' Gerry Adams too told me that 'within reason' there was an agreement reached about how the process would develop. Adams says there were decisions that Albert Reynolds took in the course of that process that he would not agree with but, none the less, in his briefings to the IRA he argued that the Fianna Fáil/Labour coalition was the most favourably disposed to the process and that it was likely to be there for two years: 'In other words, you had a situation of a London and Dublin government which would be running at the same general timescale.' The fall of Albert Reynolds was not something that republicans could have foreseen and nor was it something they wanted to happen. Even before Letterkenny, republicans had made clear that the Downing Street Declaration did not measure up to Hume-Adams, that it was not a solution but, so far as they were concerned, a piece in a jigsaw and their challenge emerging from the conference in County Donegal was to work to bridge the gap between the two, particularly on the issue of the exercise of the right to national self-determination. There was a depressing mood in the immediate wake of this conference, but that was lifted when private republican briefings began to point to the early prospect not just of a temporary ceasefire but of something more lasting. On 2 August I was told of that briefing that Gerry Adams had given to the IRA leadership around the time of Letterkenny, a briefing at which he outlined what he thought was politically possible. I was told that the IRA had asked for this as part of its overall consideration of the peace process, and that evening the BBC reported exclusively the information emerging from this conversation. A statement from the IRA the following morning confirmed the detail of my report. Every day now I was in contact with a range of sources spread through republicanism, loyalism, the security field and prisons -contacts designed to glean as much information as possible about the evolving situation. It was a situation spiked with many conflicting signals, for while the private republican briefings continued to point to a peace move of some sort, on the surface an altogether different impression was being formed. At the end of July two loyalists, Joe Bratty and Raymond Elder, were shot dead on the Ormeau Road in Belfast. Subsequently the IRA engaged in a series of bomb attacks on pubs in predominantly Protestant areas, attacks which hurt no one but none the less earned the scorn of loyalists and unionists. One of those pub bombings was in the south Belfast constituency of the Westminster MP Martin Smyth, who accused the IRA of reverting to the tactics of the 1970s. He warned that Northern Ireland was facing an extremely dangerous time. In this period the IRA also shot dead a leading Dublin criminal, Martin Cahill, whom it accused of having links with militant loyalism and more specifically with a UVF unit it suspected had been involved in a gun and bomb attack on .a pub in Dublin in which an IRA 'volunteer' was killed. In this period I interviewed the security minister at Stormont, Sir John Wheeler, who made clear that while the government would welcome any let-up in the violence, talks could only follow from a permanent end to the killing; any temporary cessation would change nothing and he said there was no need for any further contact with republicans: 'There is a joint declaration. It sets out the route, and the route is a permanent end to violence, proof that violence has ended and then a dialogue can commence. It's very welcome if people are not being mortared, killed and shot at - of course that's good news, very good news indeed, but it's not an answer. So the government's position was clear: a permanent cessation of violence was the only key to talks. Exactly one week before the IRA ceasefire announcement, I sat in a tiny and sparsely furnished office on the Falls Road in west Belfast and noted on slips of paper in my cheque book the latest republican briefing. The windows of the office were filled with breeze blocks, a security precaution designed to stay one step ahead of the loyalists, who not long ago had carried out a rocket attack on this building. The man I spoke to was one of republicanism's principal strategists, someone not accustomed to dealing with the press on a regular basis, and for the purpose of this conversation he was guided by a briefing note he had placed on the desk in front of him. An Irish-American delegation was due in Ireland in a couple of days' time and the inevitable ceasefire speculation had once more raised its head. The man I spoke to stressed there would be no ceasefire announcement to coincide with the visit but said there was 'no need to be pessimistic'. Republicans, he said, remained 'optimistic'. We spoke in speculative terms about how any IRA announcement might be made and he went on to tell me that what was looming 'could be the biggest story that has happened here in a quarter of a century'. He said there were no internal problems and the process remained on track. What was being hinted at here was much more than a temporary ceasefire. We welcome the opportunity provided by today's meeting to update the us delegation and to give them our assessment of the present situation. The delegation similarly gave us their views of the peace process and the role they will play in moving the situation forward. In this context, I am confident that today's meeting represents an important contribution to the development of an effective peace process based on democratic principles. Sinn Féin has always recognised the importance of the international community in helping to create the conditions which can resolve this conflict. In particular, we have pointed to the positive role which Irish-America and the US Administration can play. In conjunction with the evolving peace process here, Irish-America has focused the present us Administration on the issue of peace in Ireland in an unprecedented manner and has engaged it for precisely that purpose. We welcome the role of Irish-Americans and the Clinton administration. We are optimistic that this can be built upon. Political and popular opinion in the United States can as the peace process moves forward play an increasingly central role in the search for an inclusive, negotiated and democratic settlement in Ireland. I am confident in light of today's meeting that Irish-Americans are deter-mined to make this important contribution to the achievement of a just and lasting peace in Ireland. On Saturday 27 August I met again the man who had been my principal republican contact throughout this whole crucial period, a man I was depending on for factual insights into republican thinking at this time. By now, I had picked up from a prison source that the ceasefire announcement could be Wednesday 31 August - certainly that was the buzz coming out of the top-security Maze jail - but the man I met on Saturday, while suggesting a decision was close, emphasised that crucial pieces of work had yet to be completed. That night I reported all of this on BBC Radio Ulster. The peace process was entering its most critical phase and statements from John Hume, Gerry Adams and Albert Reynolds would follow on Sunday, thus putting all the vital ingredients in place. Adams was now able to tell the IRA that all he had suggested was possible at around the time of Letterkenny was now in place, in fact he was able to do more than that because the IRA was able to read it for itself. We met today to review the present situation. In April last year we pointed out that everyone has a solemn duty to assist in the search for a lasting peace. Since then we have applied ourselves unremittingly to this task. As a result there has been an unprecedented focus on the development of an effective peace process. Last Easter, we indicated that we were investigating the possibility of developing an overall political strategy to establish justice and peace in Ireland. We are presently addressing this area in particular and we believe that the essential ingredients of such a strategy may now be available. A just and lasting peace in Ireland will only be achieved if it is based on democratic principles. It is clear that an internal settlement is not a solution. Both governments and all parties have already agreed that all relationships must be settled. All that has been tried before has failed to satisfactorily resolve the conflict or remove the political conditions which give rise to it. If a lasting settlement is to be found there must be fundamental and thorough-going change, based on the right of the Irish people as a whole to national self-determination. The exercise of this right is, of course, a matter for agreement between all the people of Ireland and we reiterate that such a new agreement is only viable if it enjoys the allegiance of the different traditions on this island by accommodating diversity and providing for national reconciliation. We have publicly acknowledged that the task of seeking agreement on a peaceful and democratic accord for all the people of Ireland is our primary challenge. We are convinced that significant progress has been made in developing the conditions necessary for this to occur. We underline that the process in which we are engaged offers no threat to any section of the people on this island. Our objective is agreement among our divided people. In any new situation there is a heavy onus on the British government to respond positively, both in terms of the demilitarisation of the situation and in assisting the search for an agreed Ireland by encouraging the process of national reconciliation. It is our informed opinion that the peace process remains firmly on course. We are, indeed, optimistic that the situation can be moved tangibly forward. Of course the British government have a heavy responsibility in all of this. They are committed under the [Downing Street] declaration to play a positive and important role in assisting the Irish people to reach an agreed accommodation for the future and in removing the injustices which have fuelled conflict in the past. In this context, I hope to see an all-round demilitarisation of the situation and the full participation of all parties, on equal terms, in talks leading to a comprehensive political settlement. It remains my view, both as taoiseach and as leader of Fianna Fáil, that in the longer term a united Ireland, achieved by agreement, offers the best and most durable basis for peace and stability. But, in any event, there can be no return to the system of majoritarian rule which caused so much abuse and bitterness in the Stormont period. Those who have been badly treated in the past need to be assured that A neither selfish strategic considerations on the part of the British government nor intimidation or violence will be allowed to upset the free democratic play of forces, as they have done a number of times in the past. I am just as conscious of the fears and sensitivities of unionists, and the government fully accept the need to protect the civil and religious rights of northern unionists and Protestants and recognise that they have their own political identity and aspirations. Reynolds said it was his judgement that the leadership of Sinn Féin was sincere in its commitment to the peace process, and he said in a new situation where violence had ceased for good he was confident that a process of inclusive negotiations, based on democratic principles, would lead to an agreed and peaceful Ireland. A decision to end violence would be a gigantic step forward in the peace process. The final key statement before the ceasefire announcement was released by Gerry Adams on Monday 29 August; he had given the IRA leadership an updated assessment in which he expressed the belief that the current political climate provided the potential to break 'the political, constitutional and military stalemate', and the IRA for its part promised a 'speedy response'. In Dublin, Reynolds would soon be made aware of the IRA's decision. He told me he had asked through his intermediaries for some advance notice in order to be able to inform the US President and the British prime minister. Reynolds told me that John Major did not believe what he was being told and that Bill Clinton was overjoyed. For Reynolds the risks had proved worthwhile and there must have been a great sense of personal achievement. So, at the tail end of all of this to-ing and fro-ing, I met the IRA's messenger in west Belfast, a woman who carried on the tiniest piece of paper the words of that organisation's ceasefire declaration. What she read to me and what I later dictated to my news editor were words of great meaning, words that meant the possibility of something better. I reported that day that no one would dare predict that this was the end of the IRA but it was, however, the beginning of a significantly new situation. Senior police officers at RUC headquarters in Belfast had known through their intelligence reports that the effective date of the ceasefire would be 31 August but they had not expected such a clear statement of intent from the IRA leadership. In the critical months leading to the cessation the eyes and ears of the RUC had been watching and listening as the IRA moved towards its decision. The intelligence gatherers were monitoring that intense internal debate within republicanism. Information reaching the force was obviously of good quality for a full eight weeks before the IRA'S declaration of a complete cessation of military operations, the RUC Chief Constable, Sir Hugh Annesley, had told a news conference that the majority view within the republican movement was held by those who were 'genuinely looking at peace as a way forward'. In answer to a question from me he said he had little doubt that there was a widespread debate going on within the republican movement and he believed that the issue of a ceasefire had certainly been the subject of discussion. In reply to a follow-up question from David McKittrick, the Independent's Ireland correspondent, he said he suspected that both a temporary and a complete cessation of violence were being discussed. What would eventually emerge, he said, was a matter for absolute speculation. About three months before the ceasefire announcement the intelligence services had suffered a devastating blow when ten RUC Special Branch officers were killed along with other military intelligence and M15 personnel in a helicopter crash on the Mull of Kintyre. Among the dead was Brian Fitzsimons, the head of Special Branch and the man with primary responsibility for intelligence gathering in Northern Ireland. He was replaced in that post by one of the RUC's most experienced officers, Assistant Chief Constable Ronnie Flanagan, and as 31 August approached it was he whom the Chief Constable would have depended on for detailed briefings relating to the fine detail of that evolving republican debate. Annesley openly admits that what the IRA delivered in its ceasefire statement was more than he had thought likely or possible - indeed the categoric terminology used in respect of a complete cessation was significantly in advance of what he had expected. My conversation with the Chief Constable relating to my research for this book took place on 26 January 1995, by which stage the IRA ceasefire was almost five months old. I met Sir Hugh in his office at RUC headquarters at Brooklyn on the Knock Road in Belfast, and our conversation lasted for well over an hour. Sir Hugh's reign as Chief Constable stretches back to 1989, the same year I began to specialise in reporting the security situation for the BBC, and we had met many times both socially and in work situations. Our conversation on 26 January was over coffee. It was relaxed and on the record. The Chief Constable told me that he believed the ceasefire decision had come from 'exhaustive meetings and discussions' and against a background of republicans being confronted by the combined might of the British and Irish governments. Sir Hugh Annesley said the IRA would also have known that security forces successes were going to get better rather than worse: 'In general terms very long internal terrorist activity does not produce results and it was never going to produce a result here of the sort that was wanted. A There was no way that the British government was going to be pressed to abandon its campaign on behalf of the majority of the people on this island.. . there was no question of abandoning a democracy and there was a very high degree of resoluteness within the RUC and within the army that was not going to waver.' Sir Hugh said there were other contributing factors such as 'declining funds' and a concern about condemning another generation to violence. He also believes that those escalating loyalist attacks throughout the 1990s, when the UVF and the UFF first matched and then exceeded the IRA's killing rate, also had a bearing on the IRA coming to its decision. He said within some nationalist areas of Belfast people were 'progressively growing concerned' that they were at risk, that they had had enough and that there had to be a better way. 'And I think undoubtedly they were putting pressure on people primarily within Sinn Féin which was finding its way clearly back to the Provisional IRA.' He also believes the consistent condemnation of violence from within the Churches, the media, by politicians of all shades and from other community leaders had an impact. Sir Hugh said a wide combination of events had 'led to that political development and that extraordinary statement [of 31 August 1994]'. He said it was clear that the IRA could have continued to kill people and to let off bombs but that the argument within republicanism had been won by those who were saying that more could be achieved through the political route: 'Many people have said that there wasn't going to be a military victory to this campaign and I happen to support that view. Security sources told me that for about a month beforehand the RUC knew that the effective date of the ceasefire was going to be 31 August but they had expected the announcement to come several days earlier. These sources believe that the fact that it did not indicates that there was some 'wrangling' and 'turmoil' over the exact form of words to be used in the ceasefire statement - that right up to the last minute the IRA leadership was still considering the implications of what it was going to say. Intelligence information that there was to be a complete cessation only reached the security forces about twenty-four hours ahead of the actual ceasefire announcement itself. The security sources whom I spoke to said the decision to opt for a ceasefire did not pass without criticism. Security sources say the main opposition to the move came from within the areas of east Tyrone and south Armagh, but when I spoke to these sources in the early part of 1995 there was no suggestion of the ceasefire being under threat. 'It's still the case that there's dissent in those areas, clearly the case that there's dissent and a high level of preparation for a return that those in those areas would see as an inevitable return.' It was stressed to me, however, that the leadership of the IRA was still very firmly in control and that there was rigid discipline. It was also suggested to me that in the run-up to the ceasefire a 'team' under the control of the former republican prisoner Bobby Storey was established to deal with dissent and to ensure that fringe groups like the Irish National Liberation Army and Republican Sinn Féin, which split from the republican movement in 1986, did nothing to jeopardise the 'peace process'.